Loft and apartment living is on the rise. You can’t help but notice the proliferation of apartments being built, where everything from start studios to penthouses – literally the height of luxury – are giving discerning home owners the chance to enjoy city living. Of course, the higher you go, the better the view. We’ve picked out five of the best apartments that are available at the moment, all of which provide the most stunning views – perfect for when you want to gaze out on an impressive vista while enjoying that morning coffee or early evening cocktail. If you have £595,000 to burn, this three-bedroom duplex apartment right in Birmingham’s shopping heart could be the place for you. Remodelled to a very high standard, this is deluxe living. Not only do you get to look across the city, you’ll also be able to enjoy a spot of outdoor living as it comes with a spacious terrace. Who says you can’t enjoy gardening in the centre of Birmingham? What does almost £600,000 with a B1 postcode buy you? It comes with a large open-plan lounge and dining room that opens on to the terrace; a utility room; and a kitchen with granite work surfaces, sleek wall and base units, stainless steel sink with mixer tap, integrated eye-level oven, combination oven and microwave, and electric hob. You also get a built-in wine chiller to cool that prosecco. Head up the stairs to the master bedroom with a wet-room style en-suite, two other double bedrooms and a further bathroom that has recently been upgraded. There is also a small balcony that links the master bedroom and bedroom two. The buyer will have access to a full concierge service and a residents’ gymnasium, plus an underground allocated parking space. A stone’s throw from New Street Station, Grand Central and The Mailbox, this 23rd floor penthouse in the tower of the Orion Building in Navigation Street offers amazing views of the city centre. Described as “opulent” by the agents, the two-bedroom, two-bathroom deluxe apartment comes complete with integrated Band & Olufsen sound system. It’s just the place for a city professional. It has a designer kitchen, packed with integrated appliances if you want to rustle up more than a plate of pasta; a lounge area with floor-to-ceiling windows that provide those city skyline views; a master bedroom suite with a host of luxury features, including a remote-controlled widescreen TV that is built into the foot of the bed furniture; and a second bedroom suite. The Orion building has CCTV throughout, a 24-hour concierge service and buyers of the penthouse also have underground secure parking for two cars. Located in the Jewellery Quarter, just off St Paul’s Square, this duplex apartment at the top of Sterling House in Caroline Street offers loft living at its best. At 1,200 sqft, it’s bigger than the average three-bedroom house, which is about 947 sqft, according to the Royal Institute of British Architects. 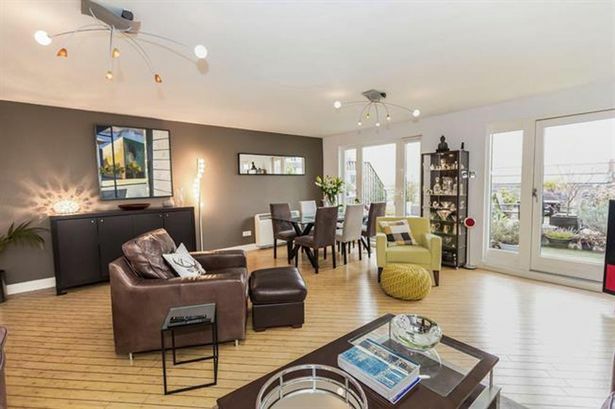 As is the case for most loft spaces, this is all about open-plan living and you’ll find the large living room, dining area and modern kitchen spreading across the first floor. You’ll also get two large bedrooms, each with their own bathrooms, plus a roof terrace that provides stunning views of the Jewellery Quarter and beyond. Buy this place and you’ll also have a secured car parking space. This is penthouse living – more than 1,380 sq ft of open-living space in an exclusive development in the city centre, close to the Jewellery Quarter and the financial district. It’s not just the magnificent views that will attract buyers to this two large double-bedroom apartment. As well as two secure parking spaces, buyers benefit from an on-site concierge, as well as a residents’ sauna and gym. To soak up even more views, there is also an outdoor communal garden to enjoy. Stylish and spacious, the open-plan living area and kitchen measure a generous 40’6” by 19’6”. The master bedroom is located on the corner, taking full advantage of the huge windows that let the natural sunlight pour in, and has a quirky en-suite wet room with curved walls. The second bedroom is also generously proportioned at 18’2” by 9’6”. A stand-alone copper bath isn’t the only feature that makes this two-bedroom, high-spec apartment stand out. Located in Water Street, close to Snow Hill Station, this beautifully furnished apartment in the exclusive Rifle Maker development has a private terrace that affords canal views. Drawing on the New York loft style of living, the accommodation has two large bedrooms, each with their own private bathroom and dressing room; and plenty of original architectural and quirky, upcycled features (including a reclaimed door from the old Birmingham Prison). The rental price is £2,970pcm.